ATLANTA -- Just over 24 hours after Interstate 85 burst into flames, authorities have announced three arrests connected to the case. As rush hour got underway Thursday, just after 6 p.m., a huge fire was seen growing underneath the busy Atlanta interstate. About 90 minutes later, a portion of the bridge over GA 13, near Piedmont Road, collapsed. Twelve hours later, as commuters hit the roads again, firefighters continued to extinguish the blaze that remains smoldering in several nooks and crannies of the rubble. The cause of the fire and subsequent collapse have not been determined. But Atlanta Mayor Kasim Reed said that city officials have spoken with the FBI and "there is no evidence that this is related to terrorism." Just after 7 p.m., 11Alive learned that authorities had arrested three people connected to the fire. (Click here for the latest on those arrests). With no injuries reported, according to Atlanta Fire Rescue Sgt. Cortez Stafford, the biggest concern for Atlanta Friday is traffic. Especially since 220,000 people drive that section of the interstate every day, according to Georgia Department of Transportation. 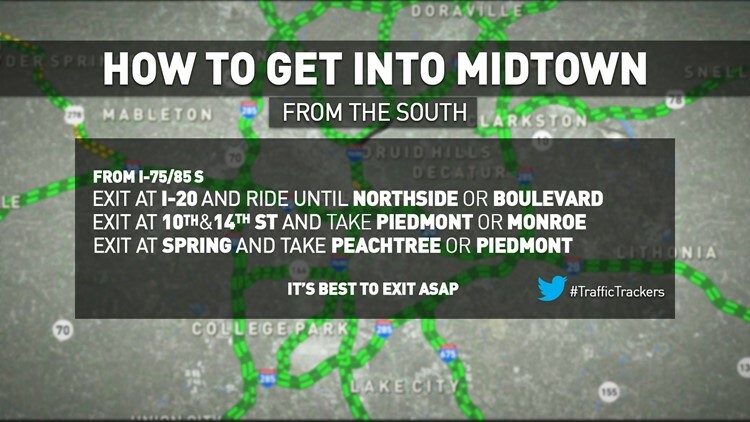 The word "indefinite" is daunting when talking about road closures, especially when it's a main artery into the heart of the city, but 11Alive will get you where you need to be as quickly and safely as possible. With that said, Georgia Gov. Nathan Dea declared a state of emergency for Fulton County and urged drivers to avoid the large section of I-85 if at all possible Thursday night. State government agencies delayed opening until 10 a.m., and employees able to telecommute were encouraged to do so. “The state is mobilizing all available resources to ensure public safety and minimize disruption of traffic as we continue emergency response efforts,” said Deal. In a Friday afternoon news conference, GDOT Commissioner Russell McMurry shed some light on what it was that burned underneath the overpass. He said high-density plastic conduit was stored under the bridge. McMurry admits that the material was flammable, but said it wasn't dangerous enough to move. he said that the fire marshal never told his agency to move the material, and that it could have been stored under the bridge since as far back as 2006. It's still not yet known what caused the fire. Dr. Lauren Stewart of Georgia Tech said she'll be studying the disaster for years to come. “GDOT does a good job of inspecting the bridges and they definitely do have a maintenance schedule. But sometimes there are things that happen that are bigger than what everybody was designing for,” Stewart said. If you're worried about driving into work, or anywhere near the city this weekend, MARTA is offering extended service and is increasing rail services. Bus routes affected by the collapse include 27, 6, 33, and 47. I-285 and I-20 are both open to traffic and are the best alternatives for motorists to utilize if possible. In response to the bridge collapse along Interstate 85, the Atlanta Police Department is working a traffic plan to ensure drivers are able to maneuver throughout the city efficiently. The APD has indefinitely closed the following roads coming into the city. Northbound Piedmont is closed at Lambert Drive. Southbound Piedmont is closed at Buford Connector – all vehicles must turn onto Buford Connector to get to I-85 SB. Access to I-85 North off of Piedmont Circle is also blocked. Lenox Road at Ga. 400 SB is blocked. There is no access from Sidney Marcus onto Buford Highway. SB on Buford Highway must turn onto Sidney Marcus. West Peachtree can only continue onto Peachtree Road and cannot access Buford Connector NB. Drivers should plan for a long commute indefinitely because this clean up and rebuilding could take some massive time. #TrafficTrackers | Together, we can get around I-85 collapse. Here's what you can to do help. If you don't work in the city, avoid the city. All thru traffic should take I-285 around the city. However, if you have to come downtown, or anywhere in the vicinity of ITP (inside the perimeter) try these alternate routes. Northbound traffic leaving downtown Atlanta is diverted to I-75. I-85 northbound is completely shut down at the I-75/I-85 split. 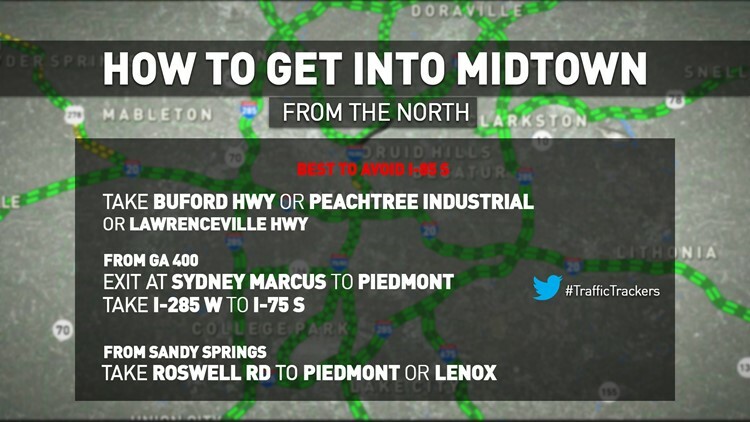 If your goal is to get into Midtown or Piedmont Road, exit I-85/I-75 before the split and take surface streets, like Peachtree Road to Beverly Road to Montgomery Ferry Drive to Monroe Drive. Anyone headed to south Buckhead should get off at Northside Drive or Howell Mill Road and go north to Collier Road or Peachtree Battle Road before heading east toward Peachtree Road. Central Buckhead traffic should get off at Paces Ferry Road before traveling east. Other traffic should go to I-285 before going east. Traffic going to the east of Piedmont Road should go to Clairmont Road or I-285 on the east before going north. Southbound traffic leaving Buckhead headed toward downtown Atlanta should head westbound on Paces Ferry Road, Wesley Road, Peachtree Battle Road or Collier Road. Traffic on GA 400 south is being diverted onto exit 2/Lenox Road. Traffic on I-85 South is being diverted onto exit 86 GA 400 North. Stay with 11Alive for daily and minute-to-minute coverage as the smoke clears and the city rebuilds.